Tagged under Julietta Suzuki, TMS Entertainment, Series. This is one of the few shoujo series I liked. I especially loved nanami as she's nothing like those other clumsy stereotypical heroines of shoujo. The art and the story is great but the manga is a bit better than the anime. I'll be watching season 2 soon. i love this anime very very very much!! the art, the comedy, the music ,the characters, they're all great, but the best thing is Tomoe, OMG!! he's so handsome!! specially when his hair become long, i love him veeeeeery much! i wish i was with him in the anime!! that'll be soooo great!! i wish they continue the story of the anime and not leave it hanging. There is a lot of reasons why i recommend to watch this anime, first the drawing is so beautiful tomoe and nanami are well drawn and the music are good and the story is cool though it remindme alot about inuyasha it got the same era and powers, the story progress well but it need more than 12 ep to finish im talking about the 2nd season the 1st is good but it isnt complete, i thought they will finish it on the second season but it didnt, i wish there will be a third season of this awesome anime i really like it or specifically like Tomoe!^^ He is gorgeous! I liked his story in the past with Akura, i want to know what will happen later, i wont read the manga so i ll wait till next century for tha next season!!! Never read the manga, but I decided I would give the anime a shot to see how I would like it. Tomoe and Nanami's interactions made the series funny. Tomoe was a bit mean and could be tough on Nanami in the beginning, but he does still look after her and care in his own way. It was nice to see him open up and them both grow to eventually like/care each other. The ending was cute. A very good anime to watch which contains romance, comedy and sometimes a little action (very few).The another reason why I love shoujo or otome anime is they doesn't stretch the story too much as compared to Shonen anime like DBZ they stetch the battle seen very much and we are also hypnotized to see what is going next. the opening and ending are also nice and fill with a good charming voice of the singer. I really love this!!!! x3 I think it's a perfect story because we can see a shoujo managa but with other elements that make it to be awesome like humour and an interesting plot with all the yokais. Lovely anime with lovely characters. Tomoe and Nanami, the main characters, have great chemistry so you'll never get bored of seeing their interactions. If you are a fan of supernatural stuff, this anime is for you because it has many elements from Japanese folklore. The OP and ED were so-so, too "shoujo" for my taste. Got me hooked up by the first episode.The art is very good and the story was short but made its point clear.It was very enjoyable and funny to watch.The start of the ending that theme song it just sounds soo good for a romantic atmosphere. Interesting and funny! xD I don't think the main elements are quite original, but the humor gives to this series a nice twist. I kinda like Nanami, she's very cool ^_^ and Tomoe has this badass aura, but not as tsundere as Inuyasha (a very close referent, for that matter). Quite lovely story <3 (of course, it more cute and complex in the manga). I suggest reading the manga instead of watching the anime big time!!! 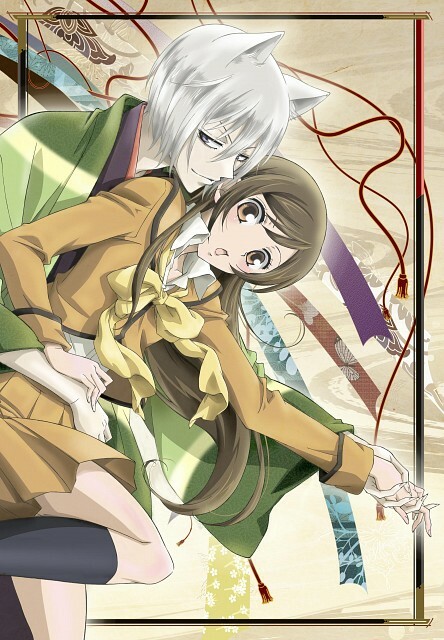 No feedback on Kamisama Hajimemashita.